We recently had a chance to test the new Chimera Titanium Rings from TacticalRifles.net. The Chimera Rings are “ultra-premium” items designed to compete with the very best tactical rings on the market. As you’d expect, they’re expensive. The 30mm Chimera Rings retail for $224.00 per matched set, including Torx driver. Though these fat boys are beefy in size, offering 7.5 square inches of clamping area per set (way more than most rings), they are very light weight. A medium-height, 30mm Chimera ring weighs just 84 grams (2.96 ounces). The Chimera Titanium Rings employ an assymetrical clamping design. This should allow the rings to provide stronger clamping force with less chance of ring distortion. Here’s how they work. After placing the scope in the lower halves of the rings, you screw down the top halves on one side only (opposite the bolt head that clamps to the Picatinny rail). After the three Torx screws are tightened fully on one side, so that the top Ring half butts firmly on the bottom half, there will still be a small gap on the opposite side of the ring (see photo). That’s by design. Final torque is applied to the side with the gap. With the final tensioning done on one side only, the scope is less prone to twist. Furthermore, the manufacturer claims this design puts less stress on the scope tube during mounting. We did fit the Chimera rings to a Leupold LRT 8-25x50mm scope with 30mm tube. Fit was excellent with no high or low points. With the rings installed as instructed, with one side first clamped flush and the opposite side then torqued to spec, the scope was very secure. On removal the Chimera rings left no visible marks on the tube. I can’t say that it would be a waste of time to lap these rings, but on our Leupold scope the fit was perfect, and the “grip” was uniform over the entire clamping surface. 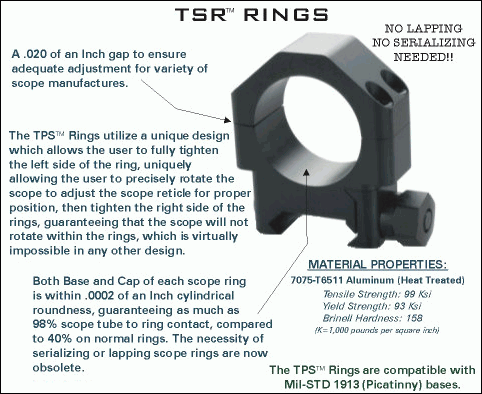 TSR™ rings made by Tactical Precision Systems (TPS) have a clamping design very similar to the Chimera Titanium Rings. After placing the scope in the TSR ring set, you clamp down one side (of the ring tops) until metal meets metal. This then leaves a gap of 0.020″ on the other side. The TSR Picatinny 30mm 7075 Aluminum Medium Rings cost $82 in aluminum or $94.00 in alloy steel. The TSR rings are narrower than the Chimeras, and have two Torx bolts per side, rather than the three on the Chimeras. An even more radical clamping system is employed by the new, patent-pending M3 Scope Rings from The American Rifle Company. The top section of the M3 rings is attached with a hinge on one side. After placing the scope in the bottom section of the M3 rings, you swing the upper ring half into place over the scope tube. Then the clamping is done with two inverted (head-down) machine screws that actually pull the hinged ring section downwards. This is designed to put less stress on the scope than conventional rings. The axis of the screws is tangential to the scope tube. Sophisticated finite element analysis (FEA) was used to develop the “over the top”, tangential-clamping ring design. According to the manufacturer, this design evenly distributes clamping forces over the tube and “eliminates the damaging effects of [scope] bending”. The manufacturer claims that, with its rings, “no significant stress concentrations are present on the scope tube”. American Rifle Co. backs up these claims with a series of 3D stress analyses published on its website. Credit The Firearm Blog for reporting on the M3 ring design. Disclosure: TacticalRifles.net loaned a pair of Chimera Titanium Rings for testing and evaluation.